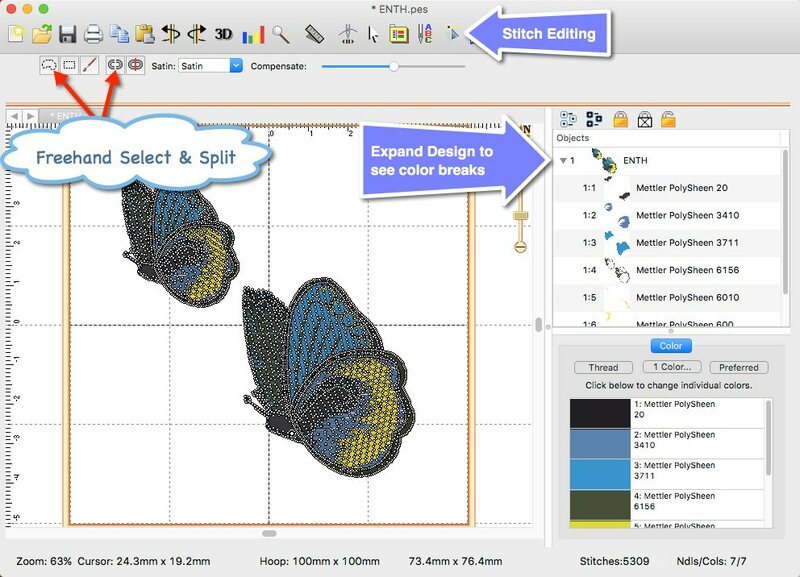 The stitch editing of Embrilliance Enthusiast allows you to split out part of a design in one operation.Working with this design, you can see that the two butterflies will stitch out simultaneously. Each color is in both butterflies and will stitch out in order together. To split out the top butterfly, I will use the Freehand selection tool (1) to lasso the top butterfly (2) and then click on the split function (3). If you do grab other stitches, it might be easier to copy and paste the split selection into a new design page instead of trying to fine tune the selection in the current design page. 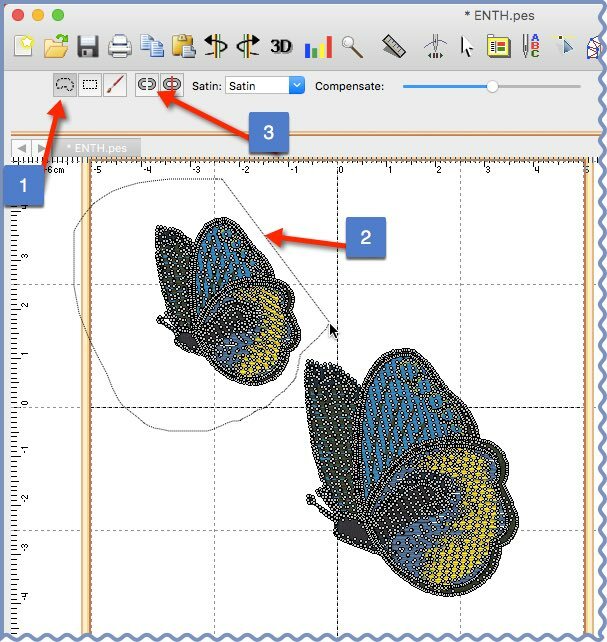 Remember that you can use other program features such as the “lock” in the object pane to help you make your stitch selections. Once you make your selection and click on the split function, you will have another design in the object pane. This means that you can treat this new design just like any other merged design. The “split” design can be copied, pasted, and manipulated like any other design object. 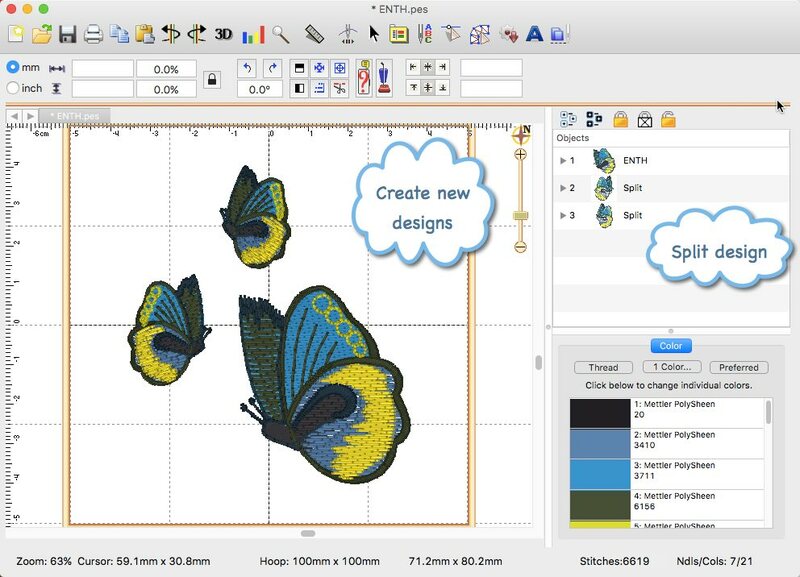 Use this function to create new designs from existing stitch files that reflect your personal creative choices! 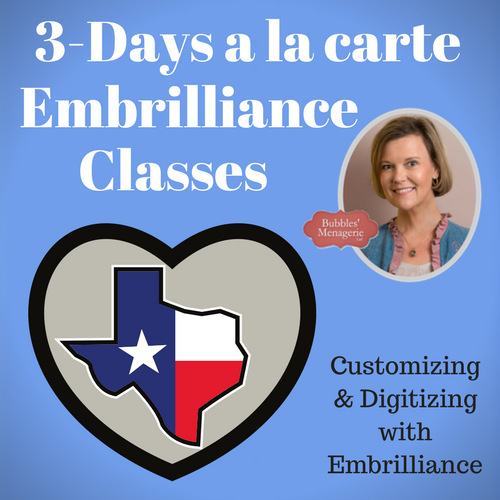 For more information about the Embrilliance programs such as this feature of Embrilliance Enthusiast, please use my link to visit their website. If you are looking to purchase and would like to see if I have a discount available, send me an email! ← Big Embroidery with a Small Hoop – Take a class and see how to do this!